Marco Polo has a strange place in the fans of Doctor Who fans. It was only the fourth story broadcast in the very first season, back in 1963, and except for some faffing around with some entirely notional cavemen in An Unearthly Child, it was the first example of a kind of storytelling that was initially at the absolute heart of the Doctor Who concept: the ‘pure historical’ story, where the only dangers that the Tardis crew encountered were the people and the forces of history with whom they tangled. It was part of the original remit of the show to entertain its audience while teaching them things about history and science, and while the spacefaring side frequently illustrated some scientific principle or other, history was to be illuminated by taking the crew into pockets of the Earth’s own past and seeing how they survived. Quite apart from which of course, the BBC had a glorious reputation for costume and historical drama, which meant you could cut down costs on props and costuming if you turned Doctor Who into a historical drama for a handful of weeks. By – at the very most – the end of the Second Doctor’s time in the Tardis, the gloss had rather worn off the pure historicals, and only once more in the Classic era, and never quite yet in New Who has the Tardis team tangled with just the forces of history (although maybe you could argue for Demons of the Punjab….). But the first season of the show was rich in these historical epics – after Marco Polo, Season One also gave us The Aztecs and The Reign of Terror. 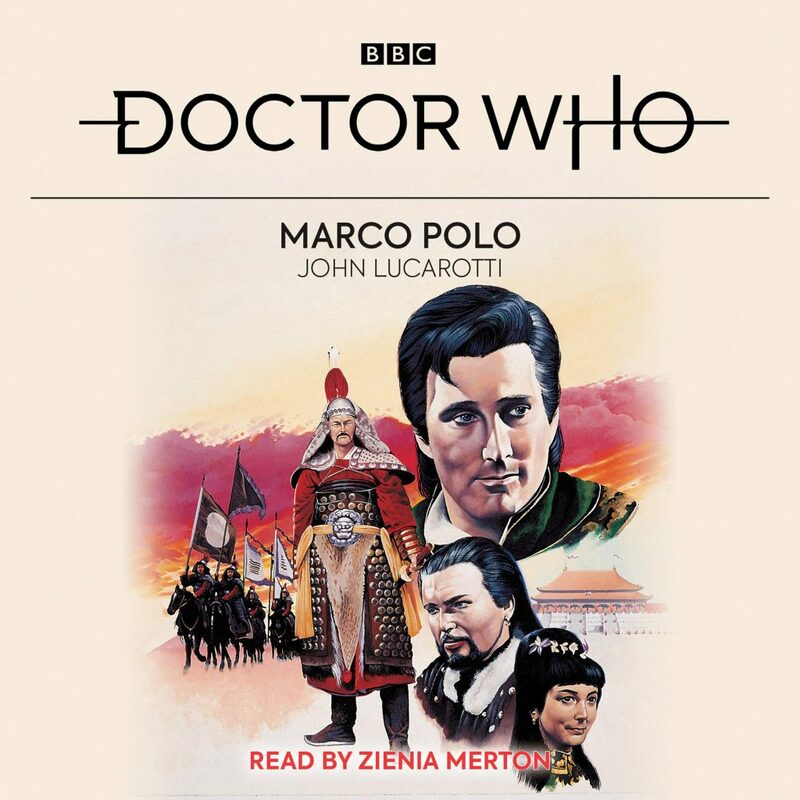 John Lucarotti wrote both Marco Polo and The Aztecs, and subsequently novelised them both. The audio version of Marco Polo has taken until 2019 to reach us, and sadly, it’s an oddish affair. Already in its fundamentals rather heavier on history and lighter on actual adventure than The Aztecs, Lucarotti in the novelisation seems almost determined to downplay the character interactions that – from listening to the audio of the episodes, as the visuals are sadly missing – we know added life and colour to the broadcast version. The idea that the Tardis travellers get caught up in Marco Polo’s journey to Kublai Khan, and that Polo determines to give the Tardis to the Khan as a gift (*cough, cough* bribe) so that he can stop pratting about all over the orient and go home to Venice is robust, and easy to buy. The inter-tribal or interpersonal politics that see warlords plotting to kill our time travellers, and even establish themselves as the new Khan, feel like they bubble along more or less to fill pages, and when they finally come front and centre, never hit with the same dramatic force as for instance Lucarotti gets into The Aztecs novelisation’s climax. The friendship between Susan and the young Samarkandian lady Ping Cho – in the broadcast version something of a milestone in the first season, as Susan was marked out early as belonging nowhere in the Tardis dynamic, too young to equal her grandfather, and indeed too ‘young’ even to avoid occasionally being patronised by the Earth schoolteachers, and yet too old to really ‘fit’ into that childlike niche – is rendered in a mechanical way, leaving the listener feeling robbed of the bubbly dynamic of the two young actresses, even when one of them, Zienia Merton who played Ping Cho, is the reader here. A somewhat better, more comical job is done of rendering the twinkly relationship between the Doctor and Kublai Khan, two old men with old men’s complaints and a shared interest in gambling games (though Lucarotti at least in retrospect does the Doctor the service of suggesting he may be putting on the ‘old man with a bad back’ bit so as to forge a friendship with the ageing, gout-ridden ruler). More than all of this though, the fact that most of the drama of Marco Polo takes place on the trip to see Kublai Khan allows Ian, Barbara and, somewhat perversely, Marco Polo himself, to fade into the background, so in the end, your chief abiding memory of the story in the novelization isn’t of the sumptuous visuals, or the dashing eponymous character, but of a long commute in a caravan with some argy-bargy and a monstrously convenient Richard Curtis love story along the way. Oh, and a sense of suddenly craving Chinese food. Seriously, the meals in the Marco Polo novelisation will make you drool, because Lucarotti, robbed of much of the set dressing of the TV broadcast, really goes to town on the descriptions of the succulent morsels our team get to sample along their journey, as a key to evoking the ‘otherness’ of the orient in a positive light. There’s little sense of the slog, the challenges, the drama of would-be assassins, but if you finish the audio-novel without feeling like you could really go for some crispy wontons, you’ve been lulled into unconsciousness by the descriptions of the journey, and you need to go back and have a re-listen.